The owners of Lucy's, a food truck serving burgers, sandwiches and fires, are going brick-and-mortar at 1043 N. California Ave.
HUMBOLDT PARK — The husband-and-wife team behind Lucy's, a food truck that serves burgers, sandwiches and fries, is opening a brick-and-mortar restaurant where their pierogi spot, Pierogi Street, used to be. 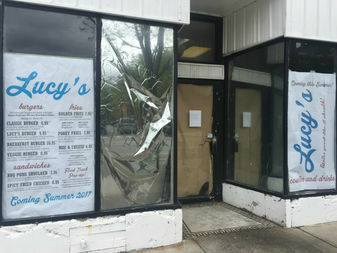 Jessica and Damian Warzecha are planning to open Lucy's, 1043 N. California Ave., sometime this summer, according to a sign recently posted on the door. The menu will include a selection of signature burgers made with fresh Angus steak cuts on brioche buns, sandwiches with barbecue pork shoulder and spicy fried chicken, hand-cut fries and mac and cheese. Prices will range from $7.95-$10.95 for burgers and sandwiches. Inside, patrons can expect a '60s theme with pin-up girl art and upbeat music, according to the sign. The pair, who currently run three food trucks — Lucy's, Pierogi Wagon and Flying Tacos — are also planning to convert the backyard into a patio complete with cafe lights, flowers, a ping pong table and possibly a fire pit. "Our vision is to create a quick casual concept with fantastic food, '60s-inspired drinks and beer from Chicago-area breweries that we've come to know and love while serving our food trucks at their breweries," the sign reads. Until the restaurant opens, the Lucy's food truck will be parked out front on the weekends, serving lunch and dinner. In 2015, the pair closed Pierogi Street due to lack of business, according to Eater. "Neither breakfast nor dinner nor lunch made a profit and we've been there for over a year," Damian Warzecha told the food blog. "Financially it did not make sense." After the pierogi spot closed, Damian Warzecha told the blog they were going to use the storefront as a commissary and showroom for their food truck and catering business. According to the blog, the couple, who didn't immediately respond to a request for comment late Tuesday, has an 18-year lease on the storefront.